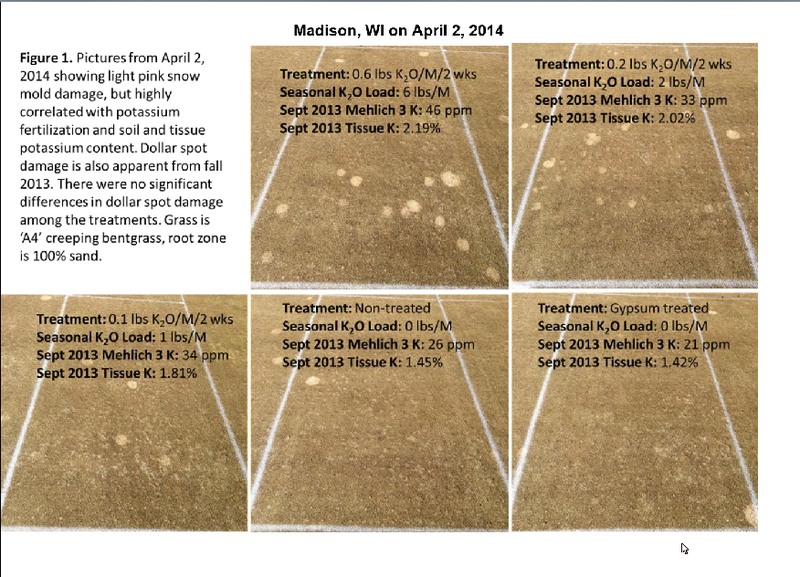 We are now safely enough into Spring that I can reflect on the Winter fusarium battle. We aren't in the clear yet, though, as we have had to battle fusarium right until the end of June in some years. The recent record breaking hot weather has sure helped but as we return to normal April weather this week I fully expect the fusarium to make a resurgence. As the title suggests, this winter was an absolute breeze when dealing with fusarium on all parts of my course. The weather was abnormally warm and wet but this didn't seem to make the disease worse as you might think. 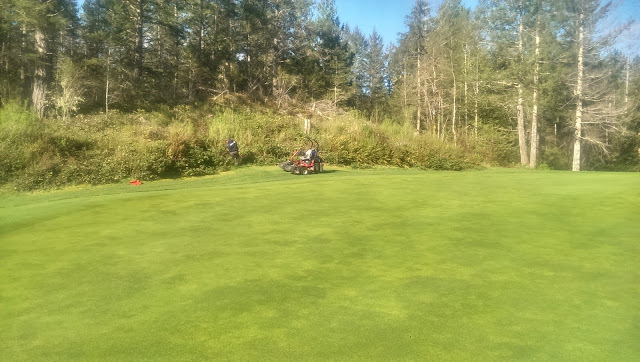 I have often hypothesized that it isn't the weather that makes fusarium bad during the winter, it's our maintenance practices that do. Sorry, I literally have no fusarium to show you. I have talked and seen other courses that did not have the same luck as me. 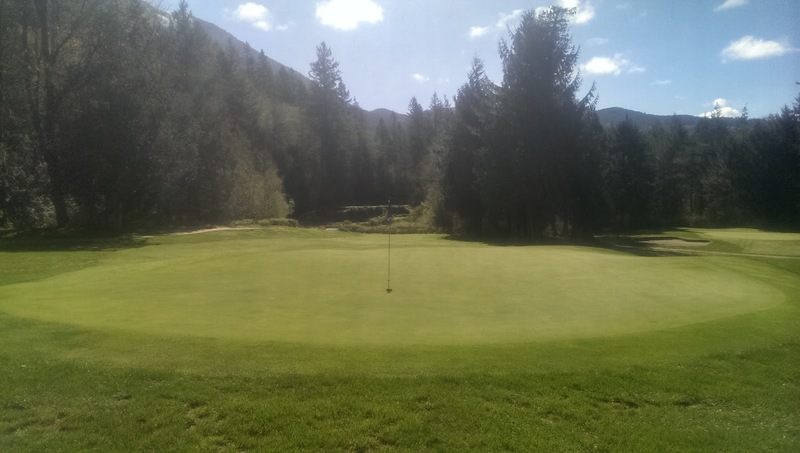 Of course no golf course is the same and there are a ton of factors involved. The reason I think I had such good success this winter is a combination of everything I am trying. I don't think any single thing I do on it's own will make a difference. I think it's a package deal. Also, this isn't the only way to succeed and I have talked with other superintendents who also had a good winter with a different approach. Recently I have found a lot of people telling me that my disease success is because of a healthier soil or a bunch of other feel-good ideas. 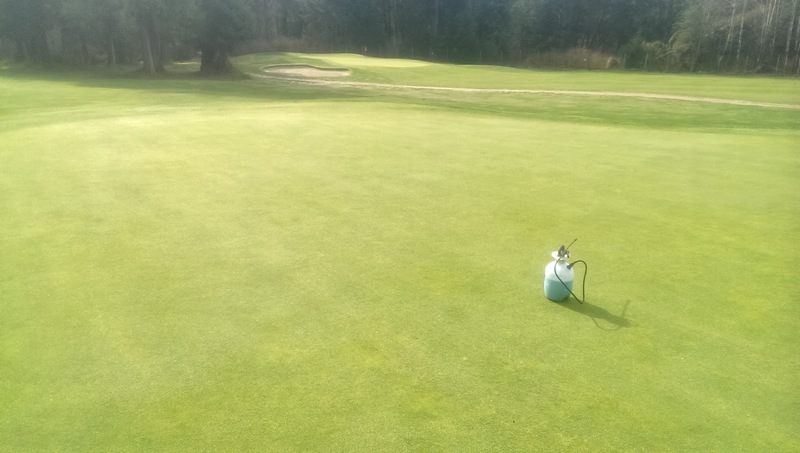 Firstly, there is no way for me to measure that, and I know that there are a lot of things that I am doing that has nothing to do with "healthy" soil that have an impact on fusarium in the winter. 3 broadcast fungicide applications; Low rate Banner app Oct 23, Low rate Heritage app Jan 19, Low rate Interface app Feb 22. I won't be surprised if another app is needed before May 1 2016 now that the cooler "normal" weather has returned, but who knows? Spot fungicide applications every 3 weeks or before mowing to get active disease spots. Regular Phosphite applications on a 250 GDD application interval. Since the beginning of Oct 2015 until beginning of May 2016 I will have only applied 2.3g N/m2 (0.47#N/1000 sq. ft.) Read more about how I fertilize so low here. In same time frame I applied 2.5g Sulfur/m2 so that's a 1:1 N:S ratio. I use ammonium sulfate as my nitrogen source for all surfaces during periods of fusarium activity for this reason. I applied 2.4g potassium/m2 so a 1:1 N:K ratio. I mowed greens less than 20 times from beginning of Oct through to end of April. We went 107 days without mowing from Nov 3rd 2015 to Feb 20 2016. I also try and time mows in the winter for dry cuts although that's not always possible. We schedule mows based on clipping yield. Read about that here. We rolled greens 50x from beginning of Oct through the end of April. I've observed that rolling doesn't spread disease like mowing or verticutting and could actually reduce it similarly to how it reduces dollar spot. I regularly topdressed greens to bring the sand up to the leaf tips instead of cutting the leafs down to the sand. This kept my greens firm and smooth all winter with less mowing required. I kept greens fully regulated with Primo Maxx through winter. Each of those things is aimed at managing fusarium in the winter without impacting playability on greens. We had a bit of bad disease on our shadiest green but for the most part the greens overwintered in perfect condition. Having said all of the above, the fairways also survived the winter well. They got low rates of N with similar rates of sulfur and no K for the past 3 years and we didn't mow them either. 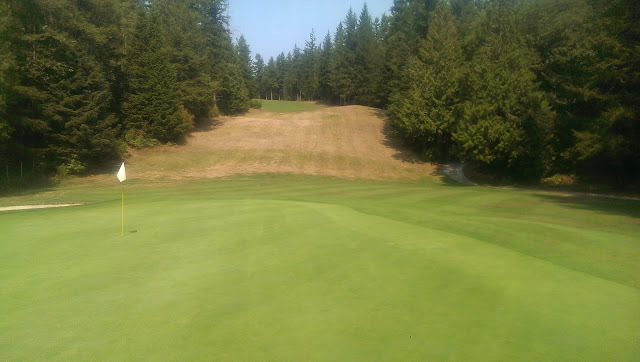 Fairways are a completely different beast than greens though. So it's pretty clear that my disease management success has little to do with the feel good idea of "healthy" soil. I still needed 3 broadcast fungicide applications. I probably prolonged their control by growing grass slowly. Less product was removed via mowing. I battled disease spread via mowers by spot spraying active disease spots, by mowing as little as possible, rolling, topdressings, and keeping the grass growing as slow as possible with growth regulators and low N fertilizer rates. I'm still on the same 4L spray mix for 2016! A little goes a long way. I applied sulfur at a 1:1 ratio to N. It's well known that high N generally makes fusarium worse. It is also well known that high rates of sulfur can reduce the severity of the disease. The sulfur probably helped reduce the disease this winter. Phosphite! It works! One of the big benefits of it is that when disease does hit, it hits slower. This allows me time to think, react and make a pesticide application appropriate for the conditions. I can also wait it out a bit longer for better weather instead of being forced to make an application in less than ideal weather. This year phosphite has accounted for 60% of my total EIQ. As I use the growth potential formula to determine my nitrogen rates. I also applied a lot less K during the winter months which some recent research has shown to reduce the incidence of fusarium patch during the winter. With GP, over 90% of the K is applied during June, July and August each year. So you might be thinking I'm being a Debbie Downer here as far as healthy soils etc, but in order to learn and move forward we need to look at the facts and even though I don't think my healthy soil has anything to do with it. There are still a lot of positives for me this winter. The greens made it through the winter in good condition, this is the main thing. There is little point in reducing pesticides if you are left with dirt in the spring. This is one of my biggest beefs with blindly going "organic" as I shared in an old post here. 2 products, Iprodione and chlorothalonil, are going to be restricted in Canada and I only needed 1 app of iprodione this winter. If I can repeat my success in future winters this restriction should not impact my operation negatively. I can't say the same thing for other courses with actual winters but I can't also say that some of the things I am trying won't also bring successful results for those with real winters such as low K in the fall. Even though I used iprodione this winter that doesn't mean that it was required. Maybe I could have gotten by with a lower EIQ product? I will never know. I used less traditional pesticide. In the realm of public opinion this matters a lot. I can honestly say I have cut my traditional pesticide use by up to 70% over the past few year. Of course the educated know that's not the entire story, but does that matter or does the public's perception matter more? It's an issue I struggle with every day. It was easy!! This can't be understated. I wasn't chasing my tail trying to get control. This has left me with no urgency going into the spring growing season. There is nothing to recover from and I can continue to keep things lean and mean. There's nothing worse than being caught with your pants down with disease in the winter. I've been there, done that and it is not fun. If anything I could have gone by with probably less pesticides but at the time it's always hard to know that. 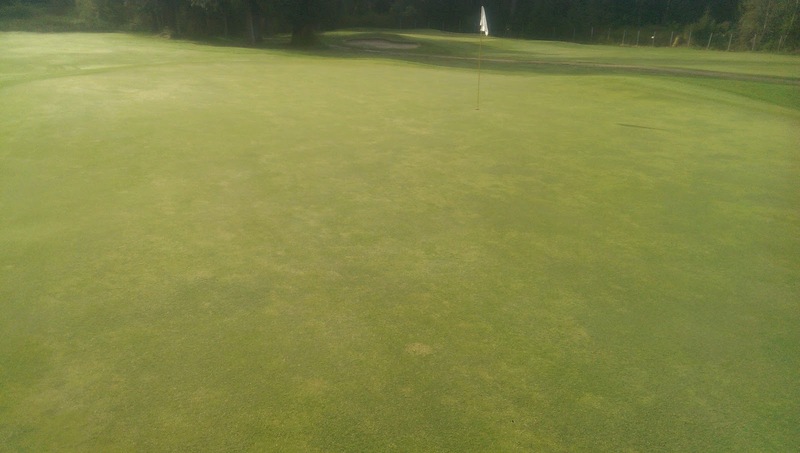 Maybe in future years I will be able to further make reductions with a slightly higher tolerance for disease on my greens because they are honestly very clean, too clean (knock on wood). Last year I was able to reduce my EIQ (environmental impact quotient) by almost 40% and costs by 30%. This year I set my goals to what I achieved in 2015. A total pesticide cost (course wide) of $3000 and an EIQ of just under 600. That's an EIQ equivalent to 2 light rate chlorothalonil apps or 1 heavy one! This is why I think organic is silly; We can make huge impacts with new low EIQ products and better IPM (integrated pest management) practices all while keeping conditions great. I don't think you could get costs or EIQ this low with purely organic practices. I think I might be approaching the sweet spot for both cost and EIQ for disease control at my course. So why not work towards my best year ever instead of the old normal? If you want to learn more about how I track pesticide use check out this post but please remember that since the time of writing that post I have learned that the EIQ is slightly flawed. Even so, it is still the best way that I have found to measure the impact of pesticides. Do you track pesticide use in a meaningful way? So taking the big reduction in both cost and EIQ goals for this year you can see that I am slightly behind on my cost and EIQ goals. I'm not worried though, as the only real disease issue I face is fusarium so if we have a dry summer I will gain ground during that period. BIG IF! Even so, it's pretty cool that I am again on track with my lowest costs and EIQ ever. Doing it once is nice but repeating it consistently is the end goal. Looking back I am confident I know why I had success this winter. It's not from the feel good reasons some people might want to believe, it is because I have planned my ENTIRE operation to manage this specific turfgrass disease while impacting play as little as possible. This is what IPM looks like. IPM isn't just one thing here and there, it's everything I do. Miss one step and I don't think you will have success similar to me. The real end result is that no one notices all this hard work. There is no compromise for the golfers, those who fund my turfgrass addiction, so I can kill grass another day.